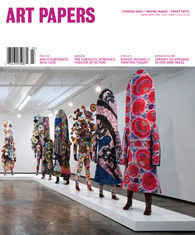 Art Papers is a non-profit organization dedicated to the examination, development, and definition of art and culture in the world today. Its mission is to provide an independent and accessible forum for the exchange of perspectives on the role of contemporary art as a socially relevant and engaged discourse. This mission is implemented through the publication of Art Paprs Magazine and the presentation of public programs.